WHAT IS THE ARTS IN EDUCATION PROGRAM? The Ames Community Arts Council’s Arts in Education program supports arts education opportunities that expand art programs outside the regular classroom and utilize artists/arts organizations in Ames. Grants are awarded biannually on the basis of merit as determined by the Arts Council board and availability of funds, up to $500 may be awarded. 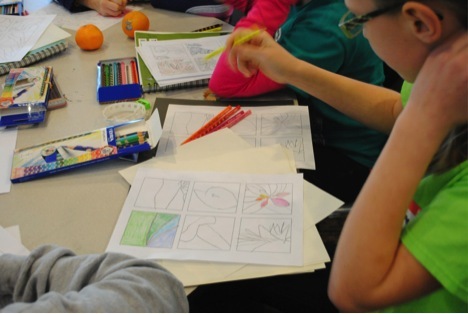 Ames Community Arts Council aims to foster an environment where schools and local civic or community organizations work collaboratively to develop educational art experiences for students of all ages who live in the Ames area. The Council is particularly interested in encouraging service learning through the arts and the use of art as tools to teach other core subjects, such as reading, writing, history, math, science, and social studies. The Arts in Education program accepts applications from Ames Community Arts Council member organizations, educational groups, and individuals who 1) demonstrate an ability to successfully complete the project and 2) are Arts Council members in good standing. The proposed project must include an Ames area arts organization or individual who is a current member of the Ames Community Arts Council. Applicants may include Arts Council membership as an expense in the project budget (the membership fee would be subtracted from the total funds dispersed). Applications are accepted twice a year. Projects that take place during the months of January through June have an application deadline of October 1, with recipients being notified by December 1. Projects that take place during the months of July through December have an application deadline of April 1, with recipients being notified by June 1. Complete Application Form and Proposed Budget. Download the application by clicking here. ​Submit applications to: director@amesart.org or Ames Community Arts Council P.O. Box 1842 Ames, IA 50010. Submitted grant application form (or separate letter) which includes all necessary information. Project has specific educational goals. Grant should not exceed 50% of the total project cost. Projects should recognize the grant received by including “supported by the Ames Community Arts Council, Arts in Education Program” when possible. A summary of the project must be submitted within two months of the project completion. Funding is provided on a reimbursement basis. Receipts must be provided. The Ames Community Arts Council board reserves the right to abstain from awarding Arts in Education grants as outlined above if no applications are received or applications received do not meet the minimum requirements. This grant is made possible by funding in part from the Commission on the Arts (COTA).